​Mexico's Congress will be asked to approve a major labour reform bill this spring as a necessary step to ratifying the new NAFTA later this autumn, say Mexican officials. Mexico's Congress will be asked to approve a major labour reform bill this spring as a necessary step to ratifying the new North American free trade pact later this autumn, say Mexican officials. But unless the Trump administration lifts the punishing tariffs it has imposed on Mexican steel and aluminum imports — duties it also imposed on Canada — Mexico is prepared to keep the status quo with the 25-year-old North American Free Trade Agreement (NAFTA). The push to improve workers' rights in Mexico was a key priority for Canada and the United States during the rocky NAFTA renegotiation because they wanted to level the playing field between their workers and lower-paid Mexican workers, especially in the auto sector. 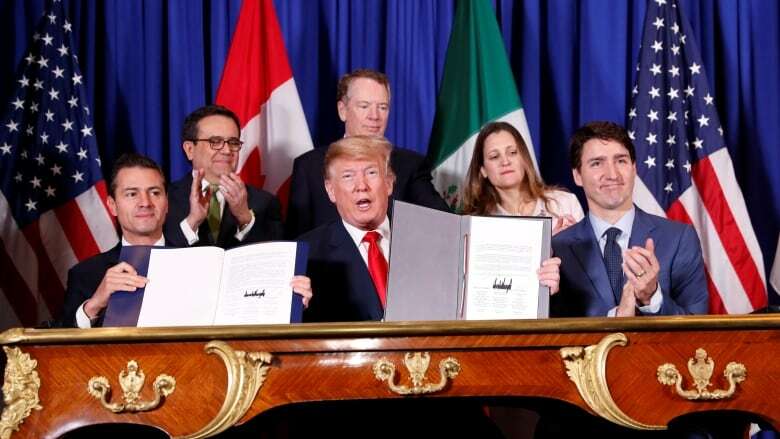 When Mexico and the U.S. reached their surprise bilateral agreement last August, forcing the Trudeau government to quickly forge a deal with the Trump administration, Foreign Affairs Minister Chrystia Freeland lauded Mexico for making labour concessions. But a senior trade official in the new government of socialist reformer Andres Manuel Lopez Obrador suggested in an interview it wasn't a huge sacrifice because elevating the status of the country's workers was a key plank in the platform that brought their Morena party to power. Lopez Obrador made it clear in his election campaign that he wanted to strengthen the rights of workers and labour unions, which made a good fit with Canada's bargaining position, Luz Maria de la Mora, Mexico's deputy trade minister, said in an interview. "With the agreement or without the agreement, this is something central to President Lopez Obrador — strengthening workers' rights and strengthening trade deals in Mexico," said de la Mora. She said the new government wants a package of labour reform ratified in Mexico's Congress before its April 30 adjournment "so we can reflect the commitments that we've made under the new U.S.-Mexico-Canada agreement in domestic legislation." That means the new agreement will be sent to the Mexican Congress for ratification after it reconvenes on Sept. 1, she said. But that won't happen unless the U.S. lifts its so-called Section 232 tariffs on steel and aluminum exports, said de la Mora. U.S. President Donald Trump imposed tariffs of 25 per cent on steel and 10 per cent on aluminum from Mexico and Canada, using the controversial national security clause in U.S. trade law — Section 232 as it's called in shorthand — that both countries say was illegal. Canadian Transport Minister Marc Garneau recently told Trump's top economic adviser, Larry Kudlow, during a public panel in Washington that the tariffs are "a serious impediment to us moving forward on what is the best trade deal in the world." On Nov. 30, Prime Minister Justin Trudeau, Trump and former Mexican president Enrique Pena Nieto, who was on his last day in office, signed the new trade agreement. It now faces ratification by the legislatures of all three countries. Trudeau spoke to Trump on Thursday and "raised the issue of steel and aluminum tariffs and expressed the need for the removal of tariffs," the Prime Minister's Office said. If the tariffs aren't lifted, de la Mora suggested Mexico is fine with the current version of NAFTA that remains in force. "We hope to have this new agreement in place. But in the absence of the new agreement, we know that NAFTA is good enough," she said. Mexico would prefer the updated agreement "for the relations we have with the U.S. and Canada but we are OK with the current NAFTA." Mexican senators, who were in Ottawa the past week to meet with their Canadian parliamentary counterparts, echoed de la Mora's assessment. "We are going to approve it, but right now our government is trying to deal with this [the tariffs]," Sen. Antares Guadalupe said in an interview. "We're not in a rush. Trade right now, it's working," she added. "We have many things to do but we want to take it slowly because it is very important to have it in a very good way for Mexico." Sen. Hector Vasconcelos, the head of the Mexican Senate's foreign affairs committee, said the ratification of the new agreement is also subject to the domestic political situations in all three countries. That includes the ongoing turmoil in the Trump administration and Canada's legislative clock, which will see the House of Commons adjourn in June until after the October federal election. Asked what happens if the new agreement is not ratified, Vasconcelos laughed. "Life goes on, I assure you," he said, referring to the current NAFTA. "It's good enough, and we will try to get it better. That's what we are going to do. We have to discuss a lot in Mexico."